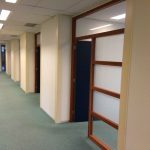 Searching for modern, affordable business premises in the heart of Rotterdam? This 695m2 office space could be exactly what you’re looking for. This spacious office is divided into smaller workspaces. More information? Contact us to make a viewing appointment, no strings attached.